The Women of the Evangelical Lutheran Church of America (WELCA) is one of the longest-running organizations at OSLC. They have a rich history of serving the Lord and of providing generous gifts of time, talent and money in support of Our Savior’s. 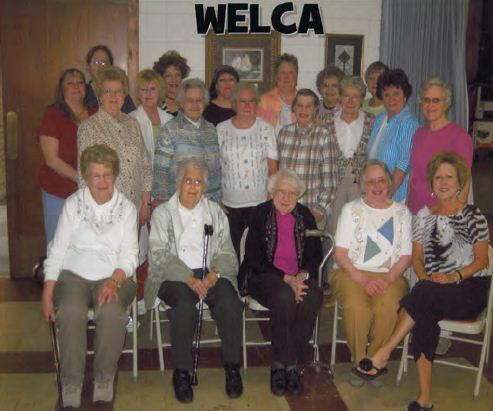 WELCA is perhaps best known for their wonderful work in the kitchen, serving meals for many pot luck events. Meetings are usually held the third Thursday of the month. All women of Our Savior’s are members of WELCA. If you have an interest in supporting any of the many causes of WELCA your contribution of time and talent and fellowship would be welcomed. As a community of women, created in the image of God, called to discipleship in Jesus Christ and empowered by the Holy Spirit, we commit ourselves to grow in faith, affirm our gifts, support one another in our callings, engage in ministry and action, and promote healing and wholeness in the church, the society, and the world. Arrive 1:15pm, play 1:30 – 2:30pm. Arrive 1pm, party begins 1:30pm. Board Meetings are held the first Wednesday of the month at 10am.